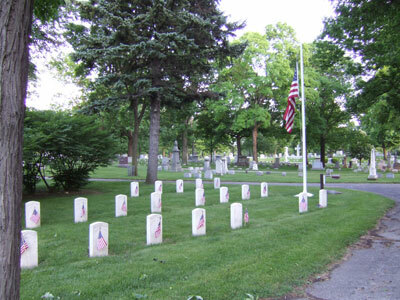 The soldiers’ lot located in Milwaukee’s Forest Home Cemetery is the final resting place for 21 Union soldiers, many of whom died of injury or illness in hospitals in the Milwaukee area. The soldiers’ lot was created in 1872 when the Federal Government purchased the small parcel in Forest Home Cemetery, the upper Midwest’s oldest rural cemetery. The simple and uniform grave markers in this section are an interesting contrast to the more elaborate memorials and markers that fill the other sections of Forest Home Cemetery’s nearly 200 acres. In 1850, leaders of Milwaukee’s St. Paul’s Episcopal Church purchased 72 acres four miles outside of the city to create a cemetery. The densely wooded parcel of gently rolling hills would become the region’s first rural park cemetery. The church leaders chose Increase Allan Lapham to direct the landscaping of the cemetery. At the time considered Wisconsin’s foremost scholar, Lapham was an engineer and surveyor known for his geological and natural history studies of Ohio and Wisconsin. Influenced by other early park cemetery designs, Lapham incorporated curving paths and naturalistic plantings to create a picturesque and tranquil landscape. The first burial took place in 1850, and a year later the cemetery adopted the name Forest Home. In the 1880s, the cemetery trustees acquired additional acreage, bringing the total area of the grounds to 198.5 acres. In 1872, the U.S. government purchased a small parcel in Section 24 of the cemetery, for use as a soldiers’ lot. The remains of 21 soldiers, many of whom had died while under care in Milwaukee’s general hospitals, are buried in the lot. Forest Home Cemetery is also notable for being the final resting place for numerous Milwaukee political and business figures. Many of the city’s mayors are buried in the cemetery, as well as seven Wisconsin governors. Victor Berger, the founder of the Socialist Democratic Party and first socialist elected to the U.S. Congress, is buried in Section 25. Prominent industrialists and business leaders interred in the cemetery include typewriter inventor and journalist Christopher Sholes, motorcycle company co-founder William Davidson, and beer barons Joseph Schlitz and Frederick Pabst. The famous Broadway couple Alfred Lutz and Lynn Fontaine, are buried in Section 33. Forest Home Cemetery Soldiers’ Lot is located at 2405 W. Forest Home Ave. in Milwaukee, WI, within the grounds of Forest Home Cemetery. The cemetery is open for visitation daily from sunrise to sunset. The soldiers’ lot is overseen by the Wood National Cemetery; the administrative office is open Monday to Friday from 8:00am to 4:30pm; it is closed on all Federal holidays except for Memorial Day. For more information about the soldiers’ lot please contact the national cemetery office at 414-382-5300, or see the Department of Veterans Affairs website. The Forest Home Cemetery’s administrative office is located on site and may be contacted at 414-645-2632. While visiting, be mindful that our national cemeteries and soldiers’ lots are hallowed ground and be respectful to all of our nation’s fallen soldiers and their families. Additional cemetery policies may be posted on site. The Forest Home Cemetery website contains the history of the cemetery and provides self-guided tour information. The cemetery’s mausoleum, called Halls of History, features exhibitions about Milwaukee's history. Forest Home Cemetery Soldiers' Lot was photographed to the standards established by the National Park Service’s Historic American Landscapes Survey.